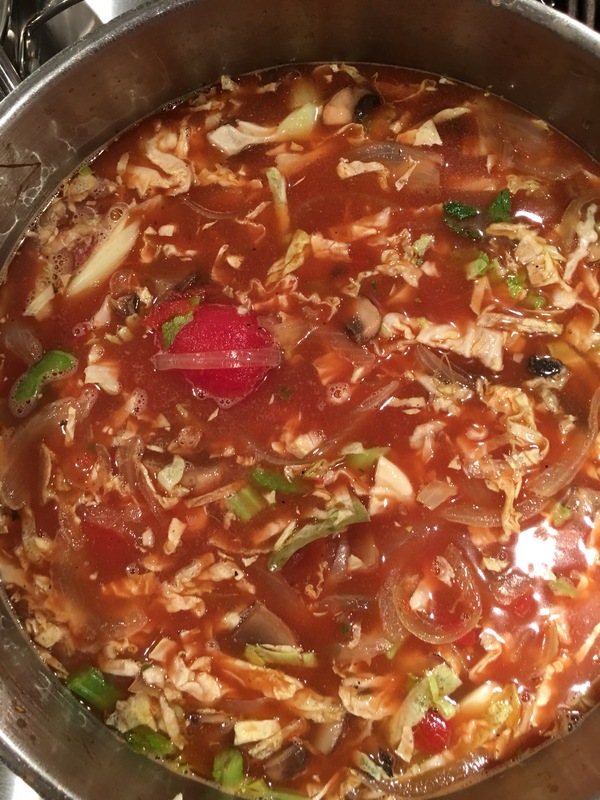 1/2 stick butter, Marsala wine, 3 cups whole tomatoes, large bottle vegetable juice (V-8), 5 large slivered onions, 5 cups sliced mushrooms (any type) , 5 finely sliced stalks celery, large whole slivered Napa cabbage, 5 bay leaves, 1/4 cup soy sauce, 10 cups vegetable broth or water, Cumin, salt, pepper, apple cider vinegar, curry, garlic powder or fresh crushed garlic. In a large stock pot, sauté your onions until brown in 1/2 stick butter then add 1/4 cup Marsala and deglaze. Remove and add your sliced mushrooms and reduce liquid. Return onion and assemble your soup by adding all the ingredients. Season with ample salt and pepper etc. Taste and balance. I add 1/2 cup apple cider vinegar but you can adjust that per your taste. Simmer for 30-60 minutes. Add water if it reduces too much such that there isn’t as much broth as you want. Check seasoning. This is crunchy, tangy, tomatoey deliciousness. The cumin warms the tones and the vinegar cuts the sweetness. The soy sauce adds even more warmth. I’ve been know to garnish with cilantro, sour cream and sliced green onion. In this bowl features at the top I’ve added some crumbled goat cheese. If you truly want some starchy carbs boil some angel hair pasta and put in your bowl and ladle your soup on top. Yum!